Maronite Bishop of Jbeil Beshara Rai said Wednesday that those who slander Patriarch Nasrallah Sfeir will be punished by excommunication. "The church does not have political inclinations. Its duty is to enlighten peoples' consciences," Rai told a press conference at the Catholic Center for Information in Jal el-Dib, north of Beirut. "The church law says that whoever insults the patriarch gets punished by excommunication; and those who raise discord against the patriarch and the bishops would get the appropriate punishment including excommunication," he stressed. 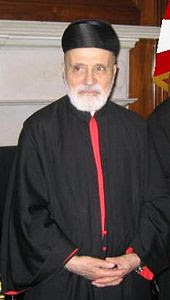 The patriarch's only concern, according to Rai, is to preserve the unity of faith and Lebanon's independence. About attacks by some media outlets and politicians on the patriarch and the Maronite church, Rai said: "The media has principles. It should grant citizens the right to know the truth… They should not slander people." "It's a pity to see the politicization of religion and declaring war in the name of religion," he said. "All patriarchs made efforts to have a single and united Lebanon. All they cared about was to protect the Lebanese entity and the unity of the faith. They paid a heavy price for that," Rai said. The Episcopal commission for communication speaks on behalf of the Catholic church in Lebanon, the Bishop said. He urged media outlets to obtain the required information from the commission. Rai said every person will be held responsible for any news story that does not cite a source from Catholic media centers. The Lebanese people should choose those who will represent and serve them best, Rai said about the June 7 parliamentary elections. "The government's responsibility is to maintain security … We ask officials not to disrupt the elections for personal reasons," he said. Rai said the country's political scene has been transformed into a battle field and politicians are clashing and fighting rather than competing on political programs. The bishop said the church and other religions condemn a private Israeli TV show that ridiculed Jesus and Mary. In the program, Israeli comedian Lior Shlein sarcastically denied Christian traditions - that Mary was a virgin and that Jesus walked on water - saying he was doing so as a "lesson" to Christians who deny the Holocaust.